Looking for an easy way to setup your WooCommerce/Shopify/BigCommerce/Opencart/Magento to Avantlink product feed? Now, follow the process step by step and get the product feed for Avantlink ready and good to export from WooCommerce and other Cloud based platforms within few minutes. 5. Select avantlink from “Select Merchant” drop down. 7. Choose your Woocommerce product category to include in WooCommerce to Avantlink product feed. 8. Type in Avantlink Category name, a list will appear, select one from the list. 9. 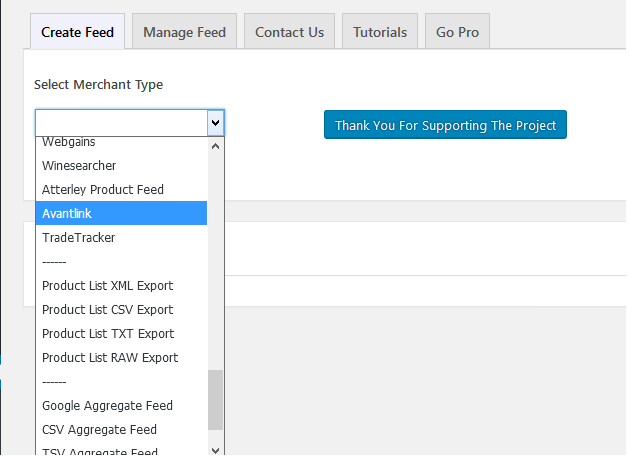 Give a name to the product feed file you create for Avantlink merchant. 10. Click on ‘Get Feed’. You can also view your recently created feeds from the Manage Feed tab. 11. Click on ‘Click Here’. You will get a feed in a new tab of the browser. Once the feed creation is completed, you can login to your avantlink account and upload the feed.